Brush insides of tart shells with egg whites. Place on two baking sheets. Bake at 350° for 5 minutes. Cool completely on wire racks. In a heavy saucepan, combine the sugar and flour; gradually stir in milk until smooth. Bring to a boil over medium heat, stirring constantly; cook and stir for 1 minute. Remove from the heat. Stir a small amount of hot milk mixture into eggs; return all to the pan, stirring constantly. Bring to a gentle boil; cook and stir for 1 minute. Remove from the heat. Stir in butter and lemon juice. Refrigerate until chilled. 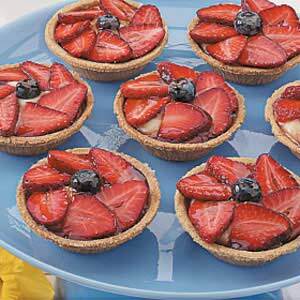 Just before serving, spoon custard into shells; top with strawberries and blueberries. Spoon jelly over fruit. Yield: 12 servings.